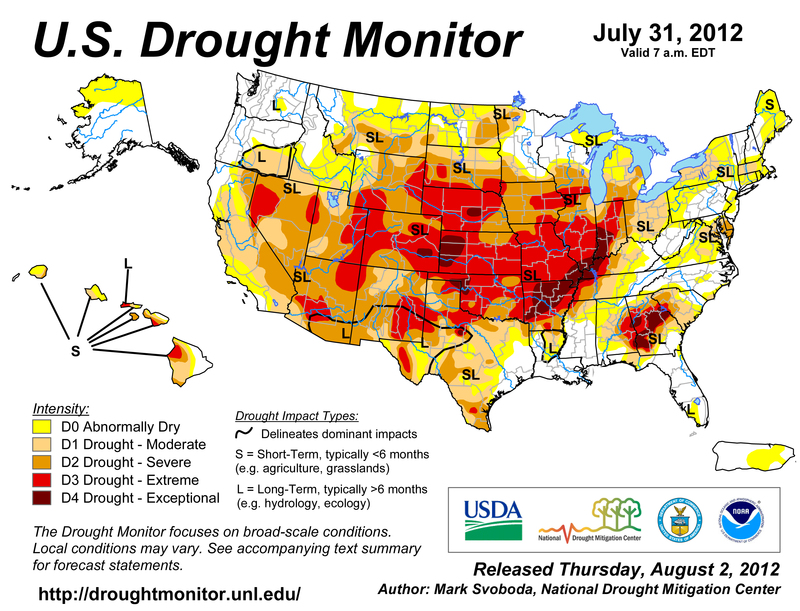 The map above comes from the USDA and NOAA’s Drought Monitor, where they publish a new version of the map every Thursday. The site provides animated compilations of its compiled findings, showing the lead up to the current situation in which more than 1,000 counties in 26 U.S. states have been declared disaster areas by the federal government (“More of America is a Disaster than Not”, via @doingitwrong). Not unrelated, NOAA is also noticing that the size of the oxygen-lacking dead zone at the mouth of the Mississippi is currently at an eighty year low. Deprived of the typical yearly dose of accelerated sediments and excessive nutrient loads from animal feces and agricultural fertilizers, fisheries and bay life might actually benefit from the current situation. Disaggregation of unknown unknowns reveals possibilities for realigning aggregated misaligned incentives on a continental scale.